Want to be a Property Millionaire? But I can’t stand and I don’t trust those books and shiny seminars that promise to turn you into a property millionaire with just $1 from your pocket and 12 months of clever decision making. If it were that easy, I’m quite sure everyone in my neighbourhood would be doing it. The truth is, few are. And the bigger truth is that even fewer women are doing it. But I’m going to have a crack, and you can come along for the ride of a warts and all attempt to invest in property. My family are crap at property investing. My family story is one of missed opportunity and disappointment. It’s historical and intergenerational. I’m wondering if I can shake this. My grandparent’s family home was taken from them during the aftermath of World War II and my grandfather spent years engaged in his own letter-based war back to Germany seeking compensation. My parents sold premium properties in Sydney in Croydon and Rose Hill in NSW before the boom. They also probably over-capitalised the family property and couldn’t retrieve the investment on its sale. Oh yeah —did I tell you about the time that I bought a property from my soon-to-be husband’s ex-partner? It wasn’t selling so he couldn’t settle his financial affairs with his ex. It had termites and was rotting. Much like my famlly’s history with investing. And just as a final kick in the guts, my family passed on the opportunity to cheaply purchase the Mangrove Hotel … in Broome. Have you been there? Google it. Shed a tear for me, would you? If property investing were easy, everyone’d be doing it, but few will and even less women are. Full disclosure in property investment matters. In all of these property investment seminars, I’m always left wondering about the truth of the matter. Was there family money involved? Was there a gifted property with equity they could draw on? Is the reported profit the position the truth? For women, it’s a harder task. Statistically, I’m behind the eight-ball in turns of income, time out of the workforce for kids and less super. I’m also from one of those Anglo backgrounds where there is not such a familial desire to fund the kids or co-invest. So how do you start out in property investment? For the past five years I’ve been putting aside $100 a month and all my tax returns into a managed share fund. It’s been difficult — particularly when I was on maternity leave — but I did it. It’s the principle of paying yourself first. It hasn’t created much of a nest egg though, and certainly not enough to fund a project, so I need partners. I also need partners because I stuffed up financially. After a tsunami of circumstances I ended up with a credit default back in 2013 when I was on maternity leave. Anyway, I cleared the bill as soon as I found out about it but it was too late to avoid the black mark. There aren’t too many lenders that would extend finance to me directly as a consequence, even if I did have the deposit. 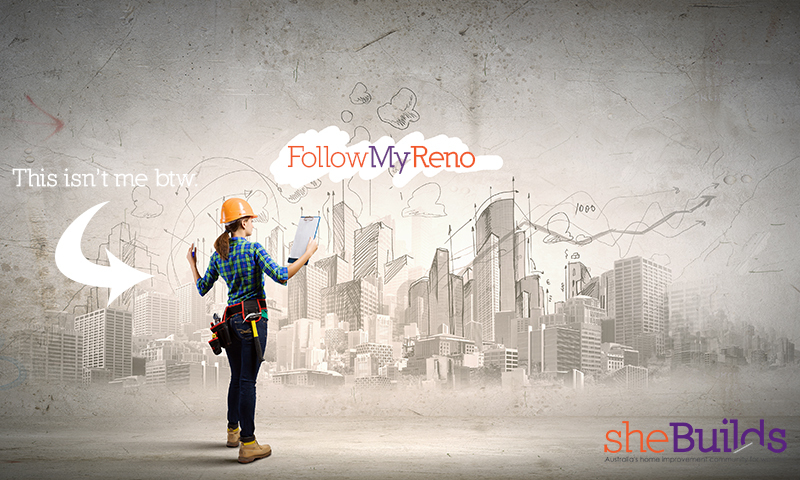 In the next installment of Follow My Reno, I’m going to talk about how to find investors, whether they be family, friends, fools and strangers to help fund your property investment. I’ll also update you on my progress in finding a partner with more cash and less sense than me. What will you build? Share with us in the comments below or hit us up on Facebook with your property investment plans. We are removating our next to last (and also our first) family home. It’s a two year plan, we are 9 months in and way behind! We bought it for a steal (aka in was full of ‘surprises) and a train station opening in the area should bump up prices in the area. I’ve never picked up a hammer in my life! So far I’ve had a crack at plastering, sanding, painting and grouting. I’m lucky to have a tradie hubby but he’s not home enough to get much done. So, now the new bub has settled in and hopefully with a little more cash available in the next few months I’ll be head buildering until the end! thanks for posting, you have your hands full in more ways than one! Which state are you in? Your story made me think of my other business’s (Jim’s Building Inspections) current project. It’s called Random Acts of Maintenance and it sounds like you’d be a great candidate especially given the surprises. http://www.jimsbuildinginspections.com.au/random-acts-maintenance/ check it out and nominate! If you have a something your stuck on but want to tackle or you want to step it up to the next ‘buildering’ challenge and you’d like me to post about it online or do a video how to, hit me up with the topic. best of luck with the building baby and the real baby. Any feedback on how you came by this article would be greatly appreciated! My next job is finishing the plastering in the laundry and then my first go at tiling! apologies for the delay in responding! I’ve been head down bum up in a renovation. I know what you mean about learning to use power tools but here’s what I’ve learned. Just start. Go to Bunnings and buy a cheap Ozito brand cordless drill, that way if you break it you won’t cry about it. You’ll also need to grab a small bundle of drill bits, these come in packs, the guys will show you a basic suite of common drill bits and Phillips (+) and Flathead bit. Just start. Grab a tool – a drill is a safe choice – find some scraps of timber and just have a crack with a few different screws or drill bits. Watch some videos and keep practising. Try starting out using your drill to put flat pack furniture together. I’ll put some videos together shortly on how to use them but in the mean time there is this hilarious guy on YouTube you should follow called Uncle Knackers – stick with me – he teaches basic trade skills and then there is this American woman who does great how to videos as well. I’ll post the link to that one too. During this latest renovation I took on heaps of work. I got my husband to teach me how to use a drop saw and a grinder and once the initial few cuts were done the fear disappeared. He’s at risk of being obsolete but there’ll always be tasks I can’t physically tackle and that’s ok. If your husband only drives a desk this may be out of reach. Would you come to something like a one day course for women in power tools? I was thinking of putting something like that together.